Clinical introduction A healthy 8-year-old boy presented to the ED with acute left shoulder pain. He had been playing football and his left arm was pulled by an opposition team member. He fell to the ground and landed on his left shoulder causing pain. On examination after analgesia, active and passive movement of the shoulder joint was possible in all directions but range of motion was limited by pain. There was no visible swelling or bruising throughout the shoulder girdle. 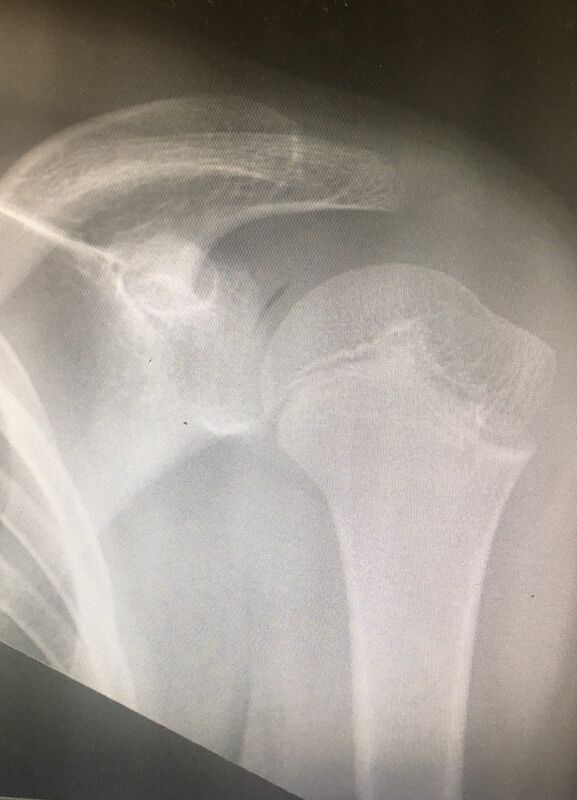 A radiograph of the shoulder was obtained (figure 1). Plain radiograph of the left shoulder. Question What radiographic finding is seen for this patient? Contributors PMK contributed to patient management, image editing, manuscript draft and subsequent revision. LW contributed to patient management, manuscript and image review. MW contributed to manuscript and image review.